The difference is the length. One is shorter, the other is longer. This Chiffon Blouse is more based towards the feeling of casual and elegance. The basic scoop neck, loose fitting silhouette and half ruffle sleeve will make you a thin looking, two layers design won't be too much see through. 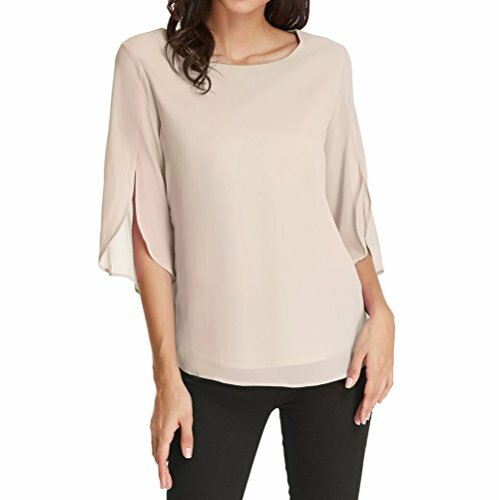 Solid chiffon blouse is soft to your skin, simple, plain, beautiful, romantic and easy matching. High fabric quality and comfortable touching, the drooping style is also great, don't miss it. Size Chart: Occording the feedback, blouse runs small,one size up better. S----Fit Bust 35.0"----Fit Waist 26.8"----Length 26.8"
M----Fit Bust 37.0"----Fit Waist 28.7"----Length 27.2"
L----Fit Bust 39.0"----Fit Waist 30.7"----Length 27.6"
XL----Fit Bust 41.3"----Fit Waist 33.1"----Length 28.0"
2XL----Fit Bust 43.7"----Fit Waist 35.4"----Length 28.3"
Hand wash, machine washable, line dry, low iron if necessary. The color of the actual item may differ slightly from the images due to different factors.